I do really like granola but it tends to be marketed as a luxury breakfast cereal and this is usually reflected in the price – at around £5 a box/packet it really is stupidly expensive. My breakfast of choice during the week is a hearty bowl of porridge, but I’m always on the look out for alternatives, especially for weekend breakfasts. 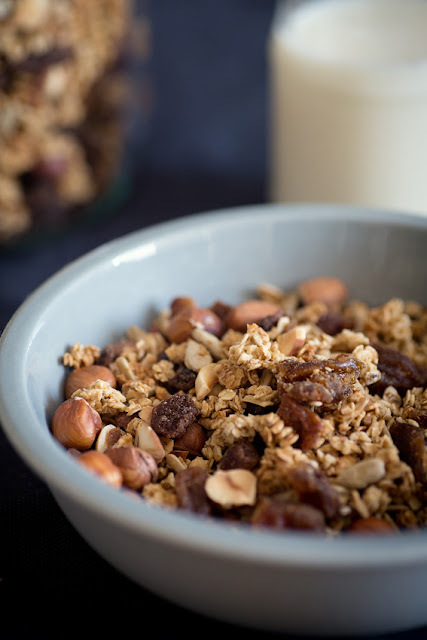 When I saw Vanesther blog this recipe for granola a few months ago I bookmarked it immediately, and this week I had a go at making some myself to enjoy this weekend. Vanesther’s recipe is fantastic and it really is simple to make, taking less than 30mins to produce your own jar of luxury cereal. In fact, now that I’ve made my own I’m even more incensed that brands have the cheek to charge so much for it in the shops! The only difference with my recipe was that I swapped the honey for maple syrup, but I used the quantities Vanesther specified and it worked a treat. By the way, if you’ve not yet discovered Vanesther’s Bangers & Mash Chat blog then do check it out! Delicious recipes and stunning photographs – and all focused around feeding a family on a budget. Your granola looks absolutely beautiful – I love your photography. 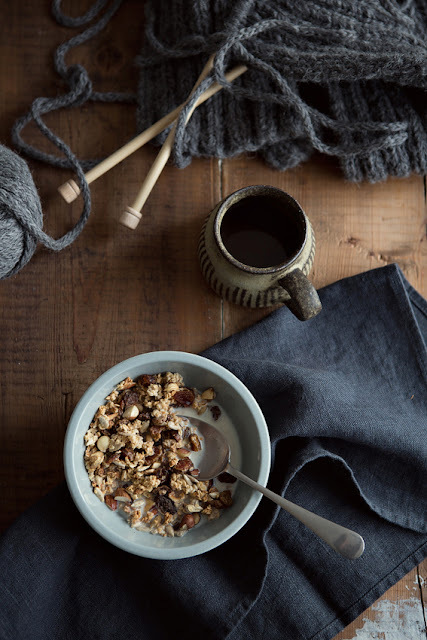 I knew granola tastes great, but who knew it could look so good too?! Thanks for sharing the recipe. Aww, thanks Vanesther and thanks for letting me share your recipe – tis now a firm fav! 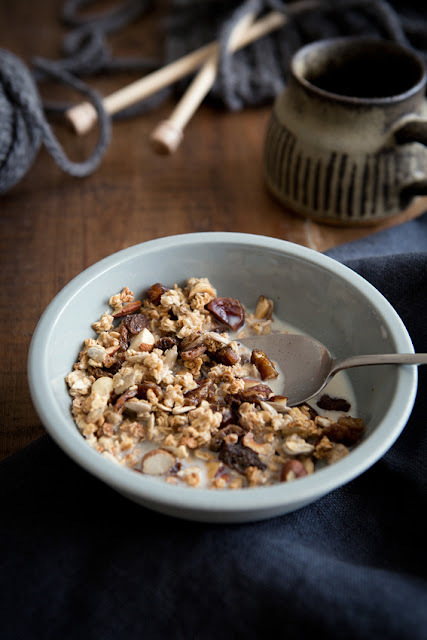 Since switching diets we have stopped buying cereals and now enjoy our home made nut granola for breakfast. I never liked paying high prices for granola but now the effort and cost is worthwhile. I really never knew it was so simple to make, and it’s so great that you can tailor the ingredients to suit your own tastes. 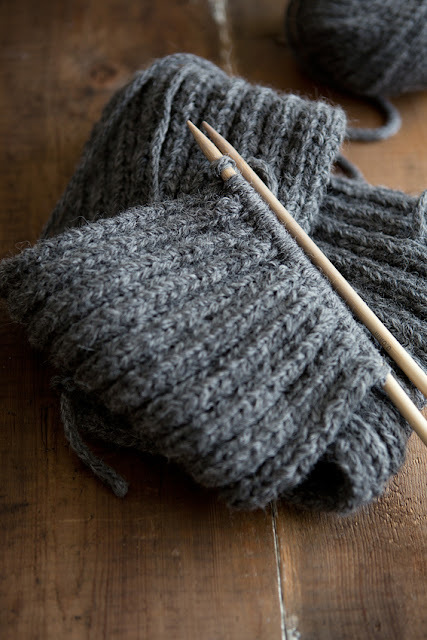 I’d be interested in your recipe – have you shared it on your blog?